This is a follow-up to my article, from a couple of months ago, analyzing the segmentation trends in the tablet market. Since I wrote that article, we have seen some more data on the market share trends of the iPad and other Android tablets, including some very interesting data on the Kindle Fire's impact. Now, let's have a look at how the data stacks up against my predicted trends. Before I get into this, let's have a look at the historical market share trends of the iPad and Android tablets over the past couple of years, in terms of quarterly sales. This shows a fairly clear trend that the market is moving towards Android tablets and away from the iPad. In fact, this shows that the iPad has lost market share in every successive quarter in which there hasn't been a new iPad launch. In Q2 2011, with the launch of the iPad 2, the Apple sales cycle gave the iPad a marginal boost in market share, which it again lost in the next quarter. 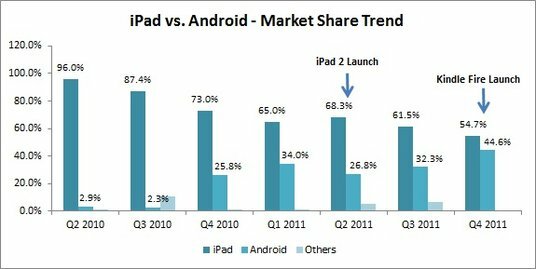 Similarly, Android tablets seemed to have received a similar boost, in Q4 2011, with the launch of the Kindle Fire. However, since we do not have data for successive quarters, we cannot say with any certainty if this is sustainable. The iPad's Q1 2012 sales performance was worse than Q4 2011, as many buyers have held off from new purchases until the new iPad launched at the end of the quarter. Apple's quarterly results showed that the iPad's sales volume at 11.8 million came in under expectations. The biggest threat to the iPad's market share will be in the last two quarters of the year, with two major product launches - the Nexus tablet and the new Kindle Fire models. I've explained the reasoning for this statement in the section below. Hence, it makes sense to stick with my original prediction of Android's quarterly tablet sales overtaking the iPad, with more permanence, in Q4 of this year. Now, the section above gives us a good view of where the tablet market is headed, but it doesn't really explain why. The key reason is market segmentation. A recent survey from ComScore highlights the market share of Android tablet usage, among individual tablets, from Dec 2011 to February 2012. At first glance, it just looks like the Kindle Fire has killed every other tablet, but there's a little more to it than that. It is important to understand that since this data shows usage share, actual sales performance would be even more pronounced. Also, since the tablet market is growing at an incredible pace, constant market share implies the segment is growing at the same pace as the market, not a flat sales performance. Now, let's have a look at this data again. Now, these figures look a lot more interesting now. Let's see what this means. 1) The two fastest growing segments in the tablet market are low cost media tablets (Kindle Fire) and Hybrid tablets. This seems to be consistent with my prediction of segmentation trends in the tablet market. 2) As I've stated before, a low priced forked tablet is no guarantee to success, as the presence of the B&N Nook Color seems to be minuscule. The key factors to a successful low cost tablet are acceptable content & good marketing push. 3) Most of the Kindle Fire's gains seem to be at the expense of Media Tablets (since most of the tablets in "Other" would also be Media Tablets). Again, this is no surprise since the functionality offered by all media tablets is practically the same, albeit at different levels of quality. However, since the Kindle Fire is at an industry leading price point it has emerged as the winner. This is also the same problem the iPad seems to be facing. 4) This also highlights that there is plenty of room in the low cost media tablet segment for more competition. 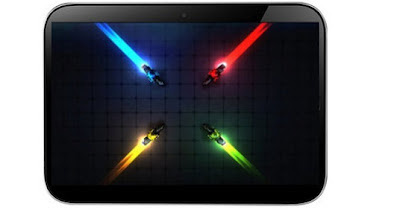 With the release of the Nexus Tablet & new Kindle Fire models, the presence of low cost media tablets will be strengthened even more and the primary victims will be other non-low cost media tablets (both Android media tablets and the iPad). Conclusion - Looking at the trends highlighted above, it looks like the iPad losing the tablet market share crown by the end of this year is a forgone conclusion, with Apple's current strategy. Apple's decisions over the next year will be very interesting to watch. It seems necessary for Apple to release a low cost 7.85" mini-iPad, at the rumored $300 price point. However, this would have a significant negative impact on Apple's profit margins, which is the primary factor driving Apple's stock price. Apple has already seen shrinking margins on newer iPad models because of its inability to raise prices thanks to competitive pressure. Since hybrid tablets are more of a long-term play, Apple's only other option is to retain the existing iPad and hope the market share loss can be contained. It looks like Apple may soon have to pick a lane in the margins vs. volume strategy, and either choice will have a long-term impact on Apple's stock. Is it possible for Apple to still increase sales with the current ipad configuration because the market is expanding rapidly? If so, wouldn't this work the way the iphone has, reduced market share, but increased sales? I realize this can only continue until the market matures.I think Apple could pull off a price increase later this year. The other manufacturers would follow Apples lead quickly. Increase absolute sales figures? Absolutely, yes. Because of the pace of growth of the smartphone & tablet markets, absolute sales will keep growing until the market matures. However, a company's stock price is driven by actual growth versus growth expectations. This means, if Apple's market share continues to decline, it will show in it's stock price. It's interesting to note, that even after Apple'e stock price jumpted by about 7-8% on the back of good Q2 results, the stock price has inched down another 6% since then. Apple has some long-term concerns to deal with regarding it's stock price, even though the short-term picture is quite rosy. And I definitely don't see any room for Apple to raise prices. Because of the rising Bill of Materials, Apple's margins on the iPad have been shrinking and they haven't been able to raise prices because of competition. If anything, competition is going to get more intense in the media tablet segment later this year. I agree competition will increase for Apple. The market share for iphones has been going down for a while. That hasn't hurt the stock price. Are you saying the stock price is going to be heavily influenced by ipad market share? 1. The iPhone's market share is still rising thanks to the presence of industry laggards like RIM & Nokia. 2. The stock market has reacted sharply to any perceived long-term threat to the iPhone's market share, sharply & negatively. Look at the 10% fall before the results, on fears of lower sales from US carriers. Luckily, the release of the iPhone 4S in China was timed right to overcome this. 3. Any major market share movement on the iPad front would also negatively impact the stock price, although not as much as the iPhone (since it's a higher revenue & margin product for Apple). The main reason for this is that from the stock market perspective, Apple is a 2 product company. The iPhone & iPad bring in about 85% of Apple's revenues, so any change in the growth expectation of either will have a large impact on the stock. There is no fight called as Ipad vs Android. Google doesnt even know how to make money from Android. If you are talking in tablet space, fight is between Amazon and Apple. Those are both arguments I've debunked over & over again. The segmentation appears quite arbitrary, Tossing the Nook into "other" instead of lumping it in with the Fire as a "low cost media tablet" appears to have been done only to keep the Nook from lousing up the explanation. In other endeavors that would be called "ignoring the data if it doesn't support the theory." As you've said yourself, it would be very easy for another vendor to create a "low cost media tablet" and fail with it. In fact, it's already happened. So the segment isn't really about "low cost." It's about "heavily promoted tablets." In that box go both the Kindle Fire and the iPad, and everything else goes in the "doesn't sell worth a hoot" segment. I don't think you read my article or my sources carefully. The Nook Color was lumped into the "Other" by Comscore, not me. All I did was added the Dell Streak to others because it didn't fall anywhere else. Comscore seems to have done this because of the extremely low share. Even if I lump all of the other categories into "low cost media tablets", it doesn't change the analysis. It's Math. And your last paragraph doesn't make any sense either. The Samsung Galaxy Tab has been promoted just as much as those two. And yet it's fallen while the hybrids have stayed flat. I suggest you read my previous articles on segmentation and android forking (both have been linked as sources in this article) before jumping to conclusions. "Apple has already seen shrinking margins on newer iPad models because of its inability to raise prices thanks to competitive pressure." Complete and utter rubbish! Q2 2012 results had Apple gross margins at 47.4%, even though Apple guidance was that margins had topped our at 44.7 back in Q1. Go look at the data. Apple makes an average gross margin on 42% on iPad sales, down from about 46-47% a year ago. The growth in Apple's gross margins has come through iPhone sales and not iPad sales. I linked the source in the article too. You might wanna take a look. Oh I did take a look. Please show me the part where "margin compression" is anything other than Reggie's fantasy. That guy throws out a bunch of numbers which are conclusions based on a combination of reported facts and WAGs (e.g. iPad hardware costs). No one outside Cupertino has that number, so his guess on it are baseless. Yeah, iFixit and others make guesses about part costs using "industrially significant quantities" as guidlines, but Apple is famous for controlling it's supply chain. In fact that is as much Apple's "secret sauce" as Jon Ives' industrial design or Steve Jobs sense of aesthetics. Your mistake is that you're taking numbers from a guy making guess, and ignoring the numbers reported by people with a fiduciary, and thanks to SOX–legal, responsibility. I guess the best thing to do is wait until Q3 '12 Apple numbers come out. Apple reports only gross margins on a consolidated basis. Apple does NOT report margins on an individual product. The information on iPad's shrinking margins has been corroborated by every single analyst who covers Apple. This isn't breaking news. The iPhone is Apple's real cash cow. The iPad has always been more of a diversification strategy in terms of revenue generation. Please have a look at my reply to your comment on the iPad Mini article for more proof. Proof? Look at your own cited articles. They don't even agree. First you cite iSuppli which says iPad margin is 37%. Then you cite UBM TechInsights, through 2 degrees of separation, that iPad2 margin is 56%. So they're right about about margin decrease, but wrong about how much (or even absolute values)? Well, maybe. All I'm saying that Apple's reported number, you know the one Tim Cook and Peter Oppenheimer are legally bound to affirm are correct, show something different–namely that Gross Margins grew from really high to really, really high (an ambiguous number I know). Is that all there is to it? Of course not. But you keep citing dubious numbers that don't add up to reality. And for the record, everything Apple does, with the possible exception of AppleTV [so far] is about "revenue generation." Man, your reading comprehension skills need serious help. 37-39% is the range for WIFI ONLY models. If you look at my iSuppli source the Wifi+4G margins are far higher. iSuppli shows the high end Wifi+4G gross margin around 51% as well.Apple reports gross margins for the whole company. Not INDIVIDUAL products! Hey guys don't get misguided by these articles and insights provided by author. Android can win in terms of numbers but they can be not be as profitable as Apple. I would suggest to read articles from a Horace Dediu : www.asymco.com .